Update: We've updated the story since CES 2016 with pricing and availability information for the US. Information for the UK and Australia isn't available at this time. Car audio maker Clarion has announced its Full Digital Sound (FDS) products, which completely change the way how sound is produced in cars, and for the better. The FDS product line-up includes the Z3 digital sound processor (DSP), which comes with a 1-inch tweeter, Z7 6.75-inch speakers and a Z25W 10-inch subwoofer. The components may sound like standard fare, in terms of car audio components, but what makes them unique is how the sound is produced. Traditional car audio sound systems read digital audio, whether it's an MP3 or CD, and sends it to a digital-to-analog converter to create an analog signal that can be amplified and heard through the speakers. This analog approach to audio hasn't changed in cars in many decades, which includes high-end audio systems that output sound to an external processor digitally. The current approach works for most applications, but analog wiring is prone to noise interference, and there's plenty of analog wiring in a car to go to each speaker. Noise interference can be a problem when installing aftermarket audio products in a car too, whether it's from the speaker crossovers, speaker cable or the car's alternator. Clarion's approach eliminates any potential noise that can arise by maintaining a purely digital signal of 1's and 0's until the speaker voice coil is driven to produce sound, using Dnote digital signal technology and a six-layer voice coil. This also means each speaker is active, or amplified individually, thanks to a chip developed in-house. The result is richer sound that's crystal clear and livelier than a conventional car sound system. Clarion prepared a back-to-back demo for FDS using a pair of the company's FDS headphones, an iPod and the same audio content. I was able to switch back and forth between FDS and analog audio for easy comparison. I was impressed with the difference in audio quality. The analog output from an iPod had muddy bass and a duller sound whereas the FDS source had warm bass notes and musical details. 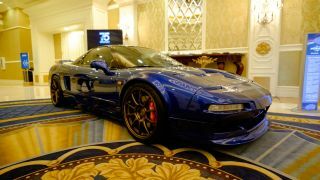 After the staged demo, Clarion let me into their custom 1991 Acura NSX that was equipped with a complete Clarion sound system, with a double din head unit, the FDS Z3, Z7 and a single Z25W for listening tests. The system sounded amazing for how simple it was. There weren't large bulky amps, sound processors or a ton of wiring, it was a simple FDS system that consisted of five total speakers. Besides the excellent sound, the Z3 FDS is an impressive little sound processor. It includes a set of 1-inch soft dome tweeters and an external Commander (control unit) with 5 x 7 dot display and rotary volume control. The Z3 is tunable via USB from an Android or iOS tablet, which lets you adjust the crossover points, time alignment and graphic equalizer. But the USB port isn't just for changing your sound settings, its accepts audio output from smartphones and tablets too. So theoretically, you can have a complete audiophile in-car sound system that relies solely on a smartphone or tablet for music playback and other functions, which is why I'm excited for the FDS. Clarion plans to ship the FDS components in April. As it's a high-end audio system, expect to pay a premium price. The cost of entry for the FDS system starts at $999.99 for the Z3 DSP and two tweeters, $799.99 for the Z7 speakers, and $749.99 for the Z25W subwoofer. So for under $2,000, you get a basic FDS system, at least for the front sound stage.